So much of what is commonly accepted about Patrick is clouded in legend and myth. The facts about Patrick's life are drawn primarily from his Confessio, a short treatise written against his detractors. Even these few facts are sketchy. Patrick was the son of a Roman-British official and was probably born somewhere on the island of Britain (though some sources say he may have been born in Gaul). At about the age of sixteen, Patrick was captured by raiders and carried off in slavery to Ireland, then a pagan land. He was put to work as a shepherd for six years until he escaped. During his captivity, Patrick experienced a conversion, and he turned from being a thoughtless youth to one with a deep faith in God. Upon returning to his family and his homeland, Patrick began his studies in the monastery at Lerins (an island off Cannes in France) and was probably ordained around the year 417. Patrick felt called to preach the Good News to the Irish people who had held him captive. He was consecrated a bishop by Saint Germanus about 432, and sent back to Ireland to succeed Saint Paulinus who had died in the previous year. Patrick traveled to all corners of Ireland, meeting fierce opposition from Druids and hostile chieftains. He usually overcame his opposition by miraculous means and eventually converted most of the island to Christianity. During his nearly three decades in Ireland, Patrick baptized hundreds of thousands of people, raised intellectual standards, founded several monasteries, ordained many priests, divided Ireland into dioceses, held Church councils, and brought the Irish into closer relations with the rest of the Western Church. 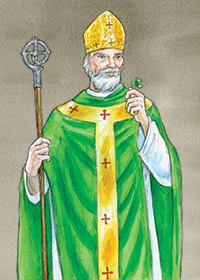 One legend about Saint Patrick explains the association of this saint with the shamrock. Upon arriving in Ireland, Patrick traveled to Ulster where he sought to gain favor with the High-King Laoghaire. Although the king himself apparently never became a Christian, many of his people and members of his family were converted. In instructing the king's two daughters, Patrick used the three-leaved shamrock to exemplify the Holy Trinity. The Irish have been strong defenders of the faith since accepting Christianity through Saint Patrick. Soon after Patrick's time, Irish missionaries began to spread out over northern Europe, bringing the whole of that region into Christianity. To this day, Irish missionaries continue to spread the Good News throughout the world. Saint Patrick is the patron saint of Ireland. Patrick's message today: It is not easy to “forgive and forget” one’s enemies. When we have a problem forgiving others, it is well to recall the words which Jesus taught us in the Lord’s Prayer, “...Forgive us our trespasses as we forgive those who trespass against us....” Patrick well heeded these words when he returned to Ireland to serve the people who had previously enslaved him. How easily do you forgive your enemies? Would you give of yourself, as Patrick did, to help an enemy?